The shoemaker and the hat-maker are neighbours who do not see eye to eye. The hat-maker believes in producing few hats and looking for the maximum profit on each, protected by tariff. The shoemaker aims to keep down the cost of his shoes through mass production and make money through free trade and exporting them. It might be a tale for our times as the global economic crisis bites ever more deeply and protectionism rears its head. 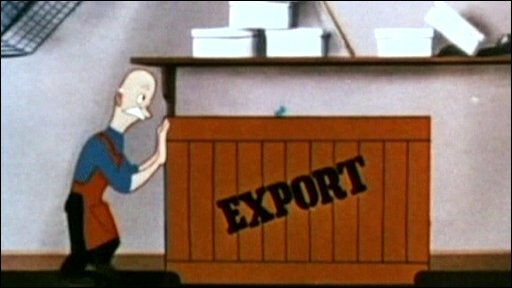 But The Shoemaker and the Hatter was an animated film made in Britain in 1950. 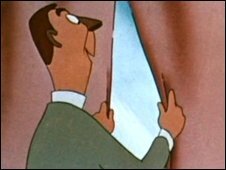 It became one of the most popular of the films made to help promote what was known as the Marshall Plan, the post-World War II project for European recovery. Now, a number of the Marshall Plan films have been shown to audiences at the Barbican Centre in London as interested archivists bring a cross-section of the films together as "Selling Democracy" to show them to contemporary audiences in the US and Europe. Lost from view for more than five decades, the films went beyond underpinning the free market principles of the economic revival and reconstruction that was at the heart of the Marshall Plan. They also sought to shore up democracy and counter totalitarianism of any kind. Another British-made animated film, Without Fear, looks at Europe's condition five years after the end of World War II and speculates about the divided continent's future. West Europeans are invited to consider whether they want the unity but not liberty of the East or want to put their efforts into creating a more prosperous and just society in the West. A red tide washes over the whole of Europe to assist the decision-making. The Marshall Plan was officially known as the European Recovery Programme and launched in the name of the then American Secretary of State, George Marshall, in 1947. Some $13bn (£8.7bn) in economic and technical assistance was provided to participant countries over four years - the equivalent today of some $90bn (£60bn). Dr Rainer Rother, of the German Historical Museum-Kinemathek, says the approach to promoting the Marshall Plan appears to have been to "do good and speak about it". Public information initiatives were well-funded and the films were effective propaganda for "Western values". Of more than 250 films made, only a few were seen in the US due to a law preventing them being shown as Americans were not to be "propagandised" with their own tax money. Sandra Schulberg is a film producer who describes herself as a child of the Marshall Plan. Her father, Stuart Schulberg, was one of the chiefs of the Marshall Plan Motion Picture Section. She says that to see the films simply as "American propaganda" is to miss the point. Most of them were the work of European filmmakers who were themselves living in the often miserable and challenging post-war conditions and they were given a great deal of freedom. Sandra Schulberg sees them as films that became a model for the social welfare state and not, she says, "a Trojan horse for American capitalism". Now audiences in Britain are the latest to be able to come to their own conclusions about these historic films. One of them, The Story of Koula, shows a big mule shipped from the US to Greece that does not take readily to working the land in its new home. A small Greek boy hitches a local donkey to the American mule to show him the ropes. A witty metaphor for the limits to American power, even if Europe had cause to be grateful for the assistance given under the Marshall Plan.